The history of water supply development dates from the nineteenth century and involved the interrelated actions of four district entities: the City of Escondido, the Escondido Mutual Water Company, the Vista Irrigation District, and the Rincon del Diablo Municipal Water District. The initial domestic water supply was a matter of individual or neighborhood wells. There was no such thing as a "public" water supply. The local water resource consisted of intermittent flow in the Escondido Creek and the groundwater available in the tiny groundwater basin replenished by the creek. In 1889, the Escondido Irrigation District was formed in order to augment local agricultural water supplies. 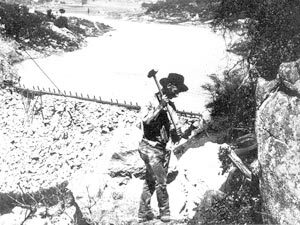 During 1894 and 1895, the Escondido Canal was constructed to bring water from the San Luis Rey River basin and the original Lake Wohlford dam was constructed to store this supply. 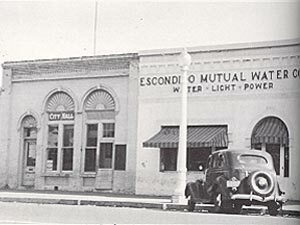 Due to financial difficulties, the Escondido Mutual Water Company was formed in 1904 to acquire and improve the facilities of the District. The improved Escondido Canal and enlarged Lake Wohlford thus provided the main supply to areas outside the city limits. The City had reached a population of over 1,500 persons by the year 1914 and the need for a true community water system was evident. The City therefore constructed several public wells (three near Beech and Valley Boulevard and three near Rose and Washington), a reservoir on Park Hill, and a distribution system of over 12 miles of piping. By 1923, the growing City had incorporated areas served by the Mutual Company and had begun to acquire rights and facilities of the Mutual Company within the City to augment the municipal supply. Also, in 1923 the San Diego County Water Company constructed Lake Henshaw by damming the San Luis Rey River, in order to increase the yield from that basin. Rather than build a completely independent system, that company jointly funded certain improvements with Escondido Mutual to transmit the water from Lake Henshaw to Lake Wohlford, and then to the service area of what is now Vista. This resulted in a dual-agency water supply arrangement that persists to the present day. In 1945, the present Vista Irrigation District (VID) acquired the interest of the older San Diego County Company. The San Luis Rey supply now shared by VID and Escondido Mutual still proved inadequate to meet demands. During the early 1950's, a well field was constructed to deliver groundwater into Lake Henshaw for downstream use. Meanwhile, during the 1940's, the Metropolitan Water District had constructed the Colorado River Aqueduct and abundant supplies of this water were available. The San Diego County Water Authority (SDCWA) had been formed in 1944 and begun delivering the imported supplies to San Diego County in 1947. Private companies were not permitted access to this water; only public agencies were eligible. The City of Escondido, therefore, could obtain this water directly but the Escondido Mutual Company could not. As a result, in 1954, the Rincon del Diablo Municipal Water District was formed. It incorporated lands in theory, eligible for water service by the Mutual Company, in practice, short of water. Therefore, the Rincon District began to supply water within its area (particularly the portion of that area near the new aqueduct) but the Mutual Company nevertheless retained certain "Parent Rights" relative to providing service. In 1970, following a long, drawn-out process, the City of Escondido acquired the Escondido Mutual Water Company. This essentially led to the present water supply. The City and Mutual systems were joined and the new City system shares with VID the local water supply delivery system and obtains imported water as well. Rincon provides water derived solely from the SDCWA aqueduct within its historic actual service area, but the City of Escondido plans to provide future service in the balance of the Rincon area by virtue of its acquired Mutual "Parent Rights." Under the present arrangement, the City and VID have jointly undertaken major improvements to the water supply system, including the construction of Dixon Lake and a major treatment plant. Since 1969 however, ownership of water derived from the San Luis Rey River has been in dispute due to a federal court suit by the Rincon and La Jolla Indians.